'Hope' is outfitted with an array of instruments that can detect even minute levels of funding, should any exist. According to Callas, Hope will first be directed toward areas of Congress that scientists believe are most likely to reveal previously undiscovered discretionary cash flows. 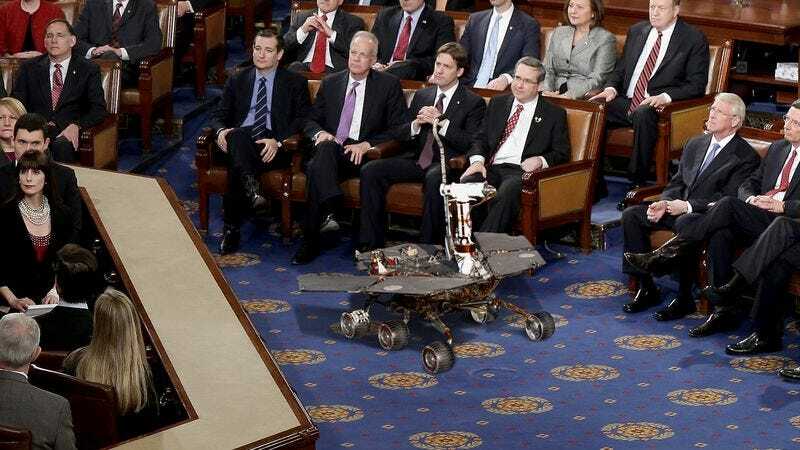 In the weeks ahead, after investigating several dozen seats on the Senate floor, the vehicle will move on to explore a structure called Mikulski’s Chambers, and by the end of the fiscal year the rover will bring its alpha-particle X-ray spectrometer online, attempting to peer into the largely opaque phenomenon known as the appropriations process. NASA engineers said the rover has several instruments that have been specifically developed for the mission at hand, noting that the vehicle’s robotic arm can flip through thousands of pages of legislation per second, its ocular scanner can analyze budget proposals for any liquid assets, and its delicate sonic gear can periodically test the atmosphere for pro-science sentiments that may have been stirred up. Hope isn’t the first NASA rover to climb the steps of the Capitol and assess whether conditions in the legislative branch might be favorable to funding. A previous vehicle, Possibility, was launched during the budget crisis of 2011, but scientists reportedly lost contact with it when it attempted to cross the aisle in the Senate and became mired in treacherous procedural maneuverings. Callas told reporters the current rover’s expedition is “absolutely vital” to NASA’s long-term research goals.